Home/Trading Platforms/SAMCO Nest Trader/How to check holdings in SAMCO NEST Trader? This shall open a new window pop-up with the holding details. You need to click on “Get Holdings” to get the details. Here you shall get the list of shares, the quantity you hold along with their live prices and their current valuation in both the exchanges i.e. NSE & BSE. On the bottom of the window, one can also check the current valuation of one’s total holdings at the current market price. In the above window, shares in the T1 Qty represent the shares that you have purchased however are not yet received yet in the demat account. Please note that it is advisable to sell the shares only if they are received in one’s demat account. There is a remote probability that the T1 shares are not received on the designated T+2 days and if you sell the shares in the meanwhile, it may result into auction of the shares. This is a risk investors should be careful of. Once your shares are pledged successfully, you shall be able to see the collateral quantity from the collateral quantity column of this view window. 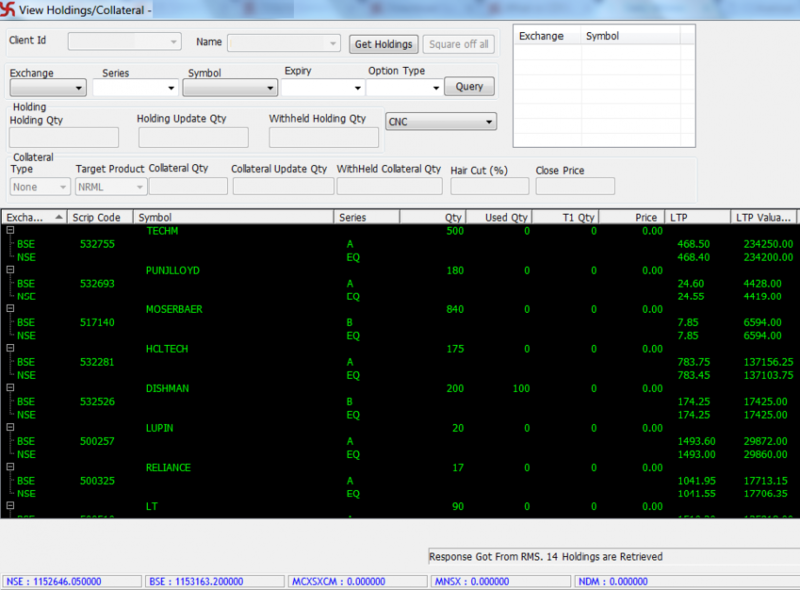 Watch the Video Tutorial to Learn How to check holdings in SAMCO NEST Trader?